A game by CSR Studios for PC and Xbox 360, originally released in 2011. The title Dead Pixels: An 8-Bit Zombie Sim borders on the artful in terms of its descriptiveness of the core gameplay. The game features an 8-bit art style with character sprites reminiscent of the 8-bit Mega Man games. 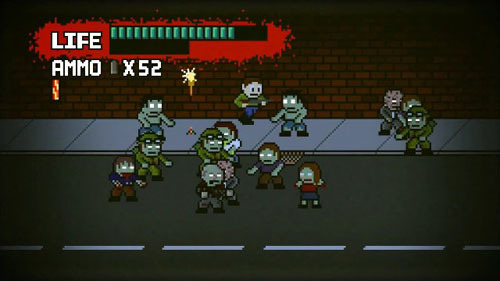 The main character faces off against hordes of the undead in a street-by-street battle to safety. But unlike a straightforward action game, you must manage your supplies, acquire money, and purchase upgrades if you hope to survive. One of the key elements to level progression in Dead Pixels is the ability to collect coins from fallen zombies, raid abandoned buildings for supplies, and make purchases and sales in shops. 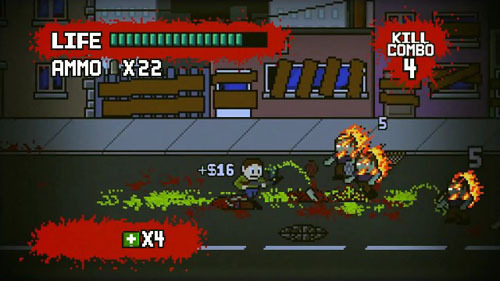 This design immediately lends itself to comparisons with the River City Ransom games, although in reality, it is more along the lines of Scott Pilgrim vs. the World: The Game (which is itself inspired by RCR), given that level progression is entirely linear. The player begins the game 20 streets away from safety (on the normal difficulty level), and he moves slowly from the left to the right and from street to street blasting the hell out of pixelated zombies. 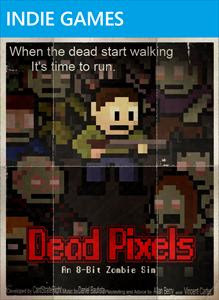 Zombies start out as basic slow movers that creep toward your position when they spot you, only becoming truly dangerous in large groups. As you move through each street, new zombies are slowly added into the mix, including long-range acid spitters, bullet absorbing tank-types, and fast moving runners. There’s even a tank-type runner late in the game that chases you relentlessly and takes tons of damage before your bullets eventually cause its head to explode. Occasionally, the game spawns a whole series of deadly zombies all around you, forcing you to be quick on the trigger, or even quicker on your feet. If you’re not happy with your speed or destructive power, you can always upgrade them. 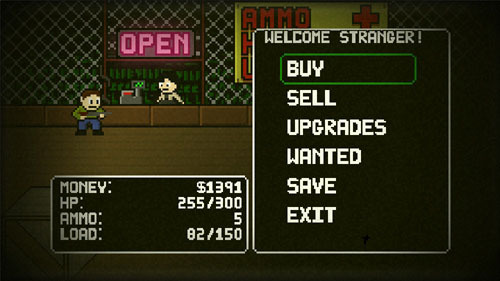 By stopping into a shop (there’s one per level, marked with green spray paint), you can buy valuable upgrades… assuming you have enough money. 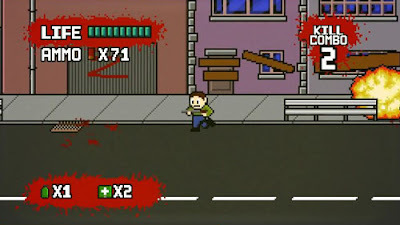 You can upgrade the destructive power of your weapons, increase the length of your health bar, bump up your strength to allow you to carry more items, increase your luck, make your melee attacks stronger, gain better bargaining skills so that you can get better prices in shops, and upgrade one of the most important skills in keeping yourself alive: your running speed. Early on, these upgrades are prohibitively expensive, leaving you to decide on one or two of the most important ones while you spend the rest of your money on weapons and restocking your ammo. 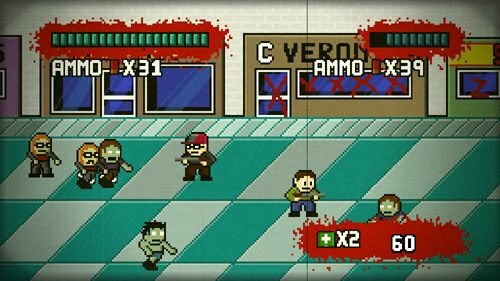 Buying ammo lets you kill more zombies, which allows you to collect more coins, which lets you buy more ammo. It’s the great circle of death. But shops only have a limited stock of supplies, and once they’re out, they’re out. Sometimes it is OK to just run away instead of killing everything in sight. You can also earn money by selling items. Each empty building can be searched, and some of the things you find – like weapons, health, and ammo – are immediately valuable. Others can be sold to merchants for cash, and each merchant has a particular item that he’s looking for, and he’ll pay you extra money for one of those. So, while you may have an otherwise useless lighter or plush toy sitting in your inventory taking up space, holding onto it could net you an extra reward down the line. But you can only carry so much. One of the sim elements that plays heavily into the game is the amount of stuff you can carry. Your strength meter shows how much you can hold, and if you pass that threshold, you’ll be slowed to a crawl. Here again, you have to balance what you’re going to keep in your inventory which even includes your weapons and health restoratives (fortunately, ammo has a zero weight). That’s a further motivation to sell off unneeded equipment, or to purchase a strength upgrade. There are several types of guns in the game, including handguns, shotguns, and machine guns, and each type comes in several varieties with different stats. Some weapons have a higher firing rate, while others have better penetration, and each offers different range and damage. 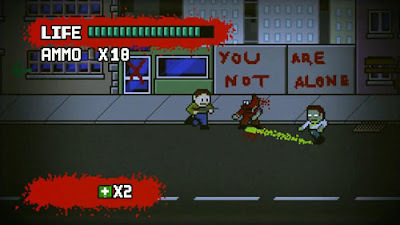 You’ll notice the difference right away; each time you shoot a zombie, a number appears above its head showing how much damage you did. You’ll quickly find that shotguns with heavy penetration are slow but great when doing a bit of crowd control with slow movers, and you’ll see that the zombies in the front of the crowd take more damage than those in the rear. Machine guns aren’t terribly powerful, but they let you saw quickly through a swath of enemies if you’re on the run. 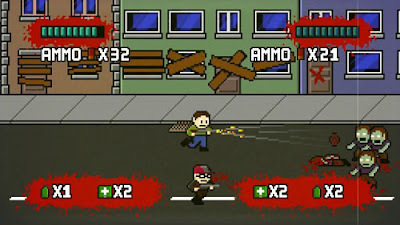 Powerful handguns and rifles let you preserve ammo while taking down many zombies in a single hit. You do have a melee ability as well, but it’s best left as a last resort. 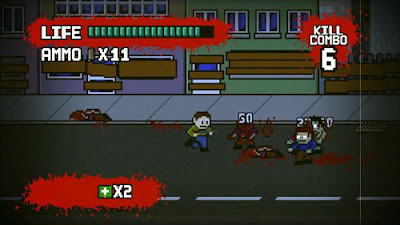 Given the low amount of damage you can deal in melee combat, it’s easy to become overwhelmed and killed. 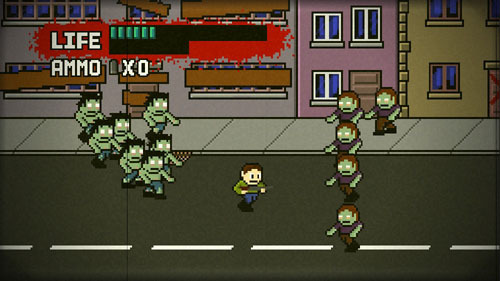 As in life, getting swarmed by zombies is a sure route to death. Whenever possible, you need to keep a safe distance, have plenty of ammo on hand, and know how the special zombie types will attack. You also have some secondary weapons that come in the form of grenades, Molotov cocktails, and the like. These can be tossed into crowds to take down a number of zombies at once… or at least to set them on fire while they keep lurching toward you. What’s also interesting from a control standpoint is that you have two separate triggers for using your primary and secondary weapons. One trigger allows you to fire to the left, and the other to the right. It seems a bit odd at first, since level progression is done from left to right (although you can backtrack into previous levels), but it’s a big help when you’re trying to get away from a horde since you can quickly dispatch enemies coming up from behind. 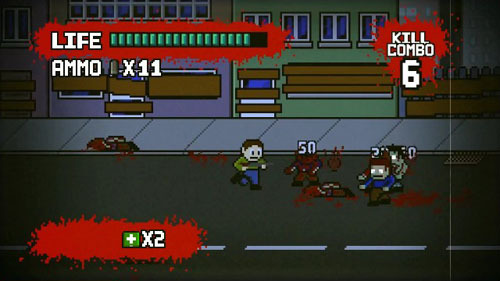 You’ll explore several types of environments as you travel through the game, including city streets and malls, although the environments do repeat. The layouts are the same in each level, with a wide playfield occupying the lower portion of the screen and rows of buildings/stores in the background. Unexplorable buildings are marked with red spray paint, while explorable ones are unmarked (although you mark them when you leave). The overall presentation is charmingly retro, featuring lots of different zombie designs, although most of them are of the slow mover variety. Bits of humor are spread throughout with interesting graffiti and store names, as well as weapons named for popular horror movies and video games. Despite the retro graphics, there actually is a fair amount of gore in the game, albeit pixelated. 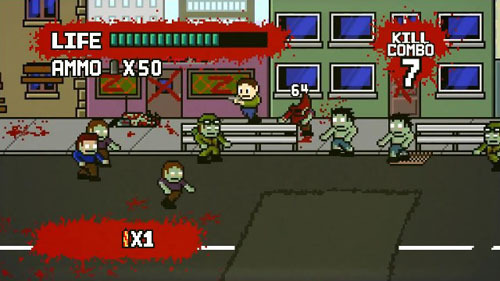 The storyline is also presented in a retro-style intro, telling players how toxic waste polluted the water supply and caused the dead to rise, killing people and turning them into the undead as well. 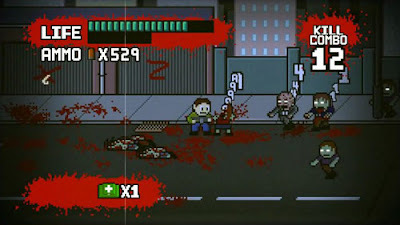 With less than 5% of the city population left alive, you must fight your way to the edge of the quarantine and escape. There’s even a grindhouse-style grain that appears over everything as you play through the game. Part of this surviving 5% can also be a friend, as the game allows 2P co-op for some same-screen action through the latest in video game zombipocalypses. Scotland-based CSR Studios (a.k.a. CantStrafeRight) is essentially a one-man studio, made up of John Common. 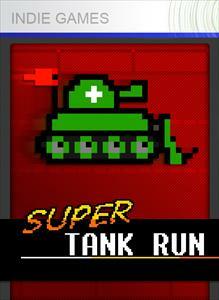 Prior to the release of Dead Pixels, he created another pixel-style Xbox Live Indie game titled Super Tank Run. 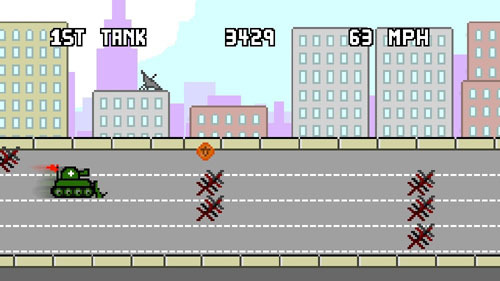 In Super Tank Run, players take control of a tank as it rolls down a 4-lane highway at high speeds. The tank moves automatically from the left to the right, and the player cannot speed up or slow down; he can only dodge, somewhat similarly to the ship in Hypership Out of Control. A second mode plays similarly, but with a 60 second timer. You still build up speed as you collect coins, but the barricades don’t destroy you when you run into them. Instead, running into a barricade subtracts points from your score. 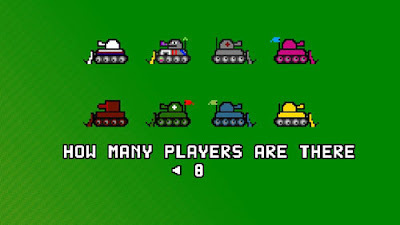 An offensive mode adds stationary enemy tanks to the mix, and gives you the ability to fire projectiles at them to build up speed. 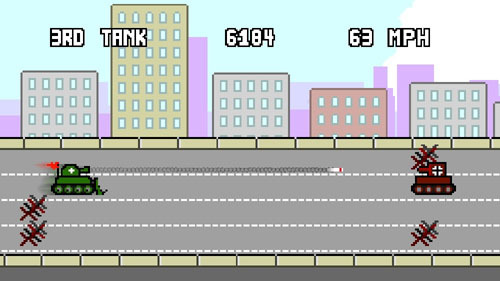 The final mode is called Turret Toss, and it tasks you with dodging barricades and grabbing coins to build up as much speed as possible. Then you can launch your turret through the air, and you’re scored for how far it travels; the faster you were going at the time, the farther the turret will go. 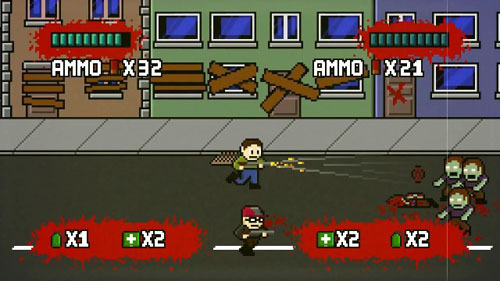 Up to 8 players can participate in local multiplayer by passing the controller around. Each of the game modes has local and online leaderboards.